Yes. 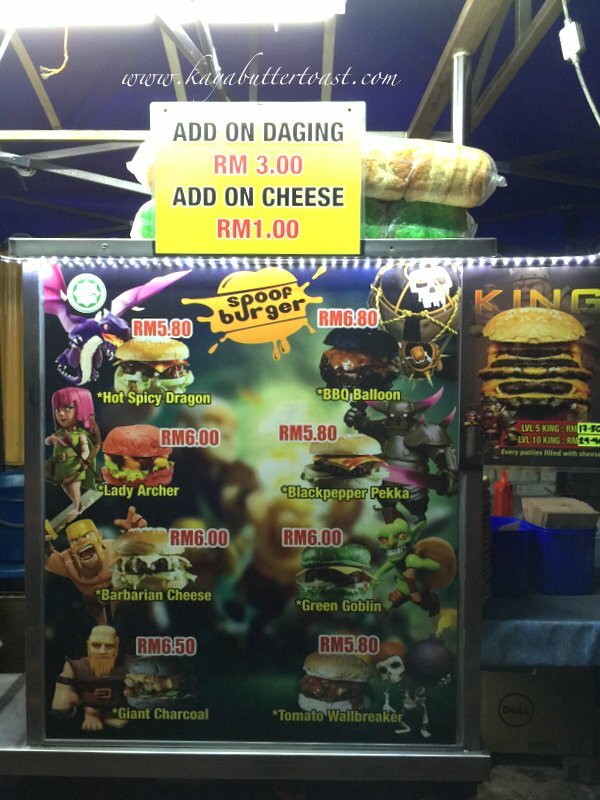 There is a Clash of Clan themed burger stall in Penang! 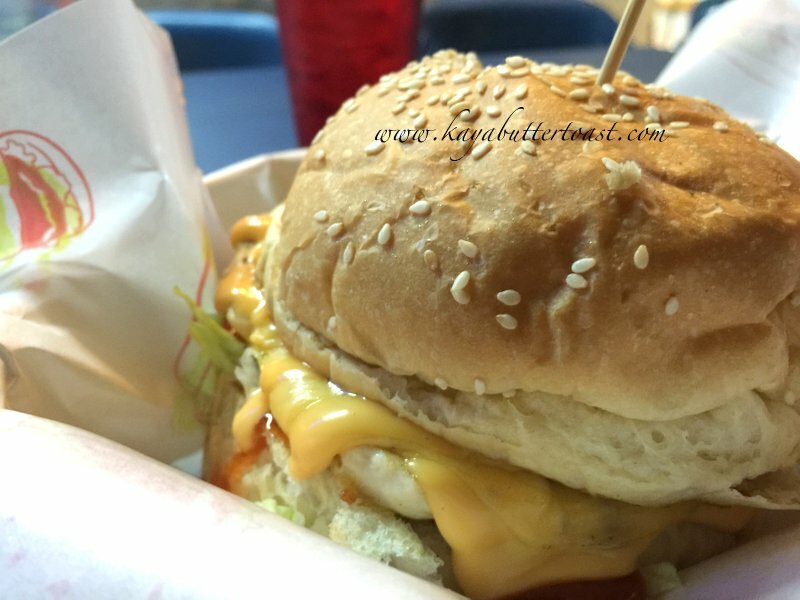 Kaya has been reading about this Clash of Clan Burger stall or some will call it as COC Burger in Penang and finally KayaButter get to taste it! 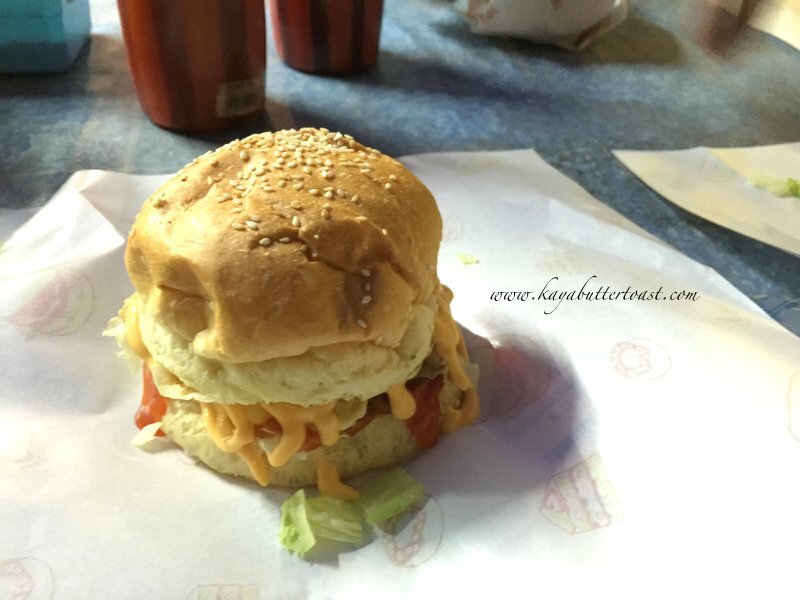 KayaButter planned to have COC Burger as dinner after our visit to Starbucks Coffee Batu Ferringhi but too bad they are not open on Sundays. 🙁 What about a bummer. KayaButter had already bought our Nikon D7000 to take photo knowing that the lighting there will be low as it is in the evening already. 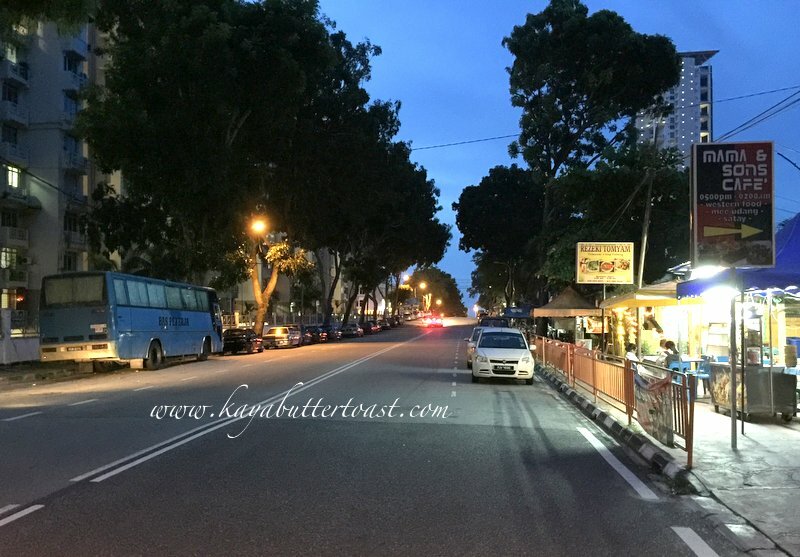 Kaya Butter went back again last Wednesday and finally after waiting for them to buka puasa, the stall is open at 8pm! 🙂 This time, all the photos are taken using Butter’s iPhone 6 Plus. Sorry for the not so good photo quality. If you are coming from Jalan Lembah Permai, drive along the road heading to the Maybank Tanjung Bungah. As you turn into the straight road leading to Maybank Tanjung Bungah, take notice of Mama & Son’s Cafe signboard in red on your right or a bus stand on your left. 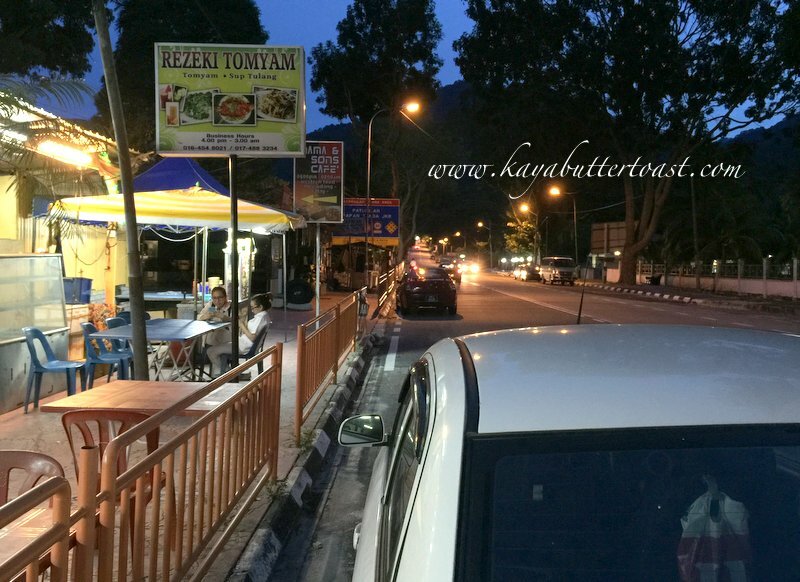 Once you see that, find a place to park on your left and walk to the Rezeki Tomyam signboard. 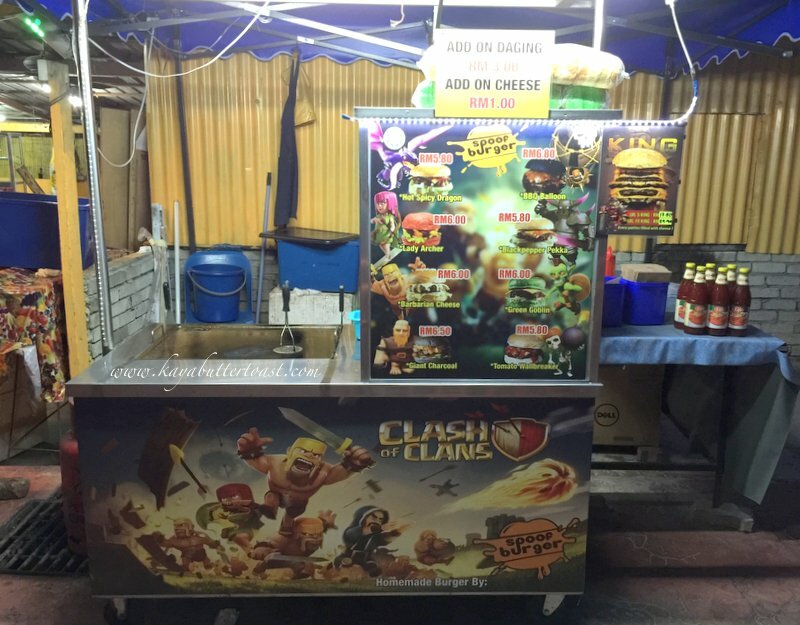 You should be able to find COC burger stall on your right. It has yellow zinc roof as their background. The description for each burger is non-existence but luckily the stall operator will explain to you each of the difference before you order. He is very friendly in explaining each of the burgers which is very good! 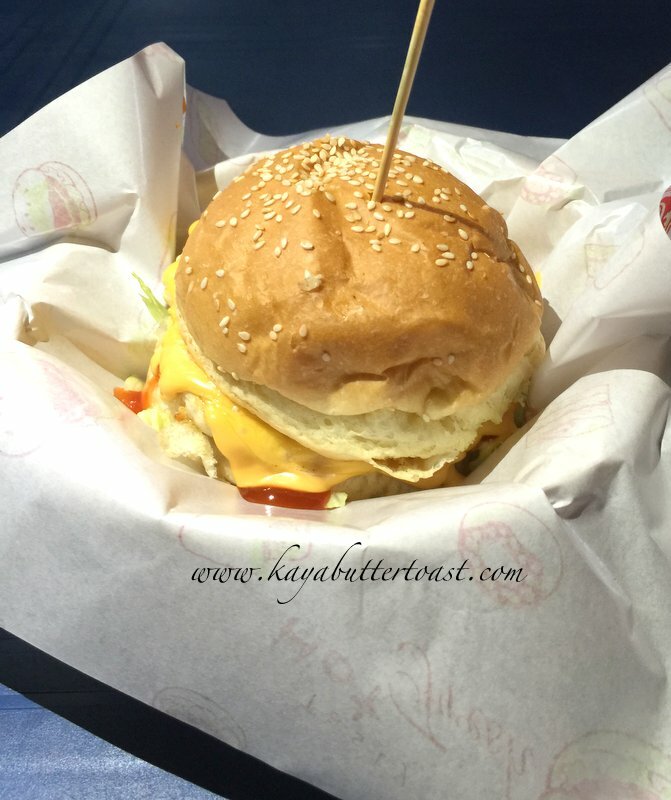 Let KayaButter help to do the explanation here so that they can concentrate to making and selling the burgers! All the burgers have two choices for their patties. Either chicken or beff. All the burgers will come with cheese and there is no option for egg. 🙁 They told us that if they add eggs, it will disturb the taste that they intend to bring out with their burgers. Well, OK… let’s see if the COC burgers will deliver. 🙂 Each of the burgers will come with Life’s chilli sauce. You can another slice of your preferred patty by adding RM3.00 and if you like your burger extra cheesy, add another slice of cheese at RM1.00 each. 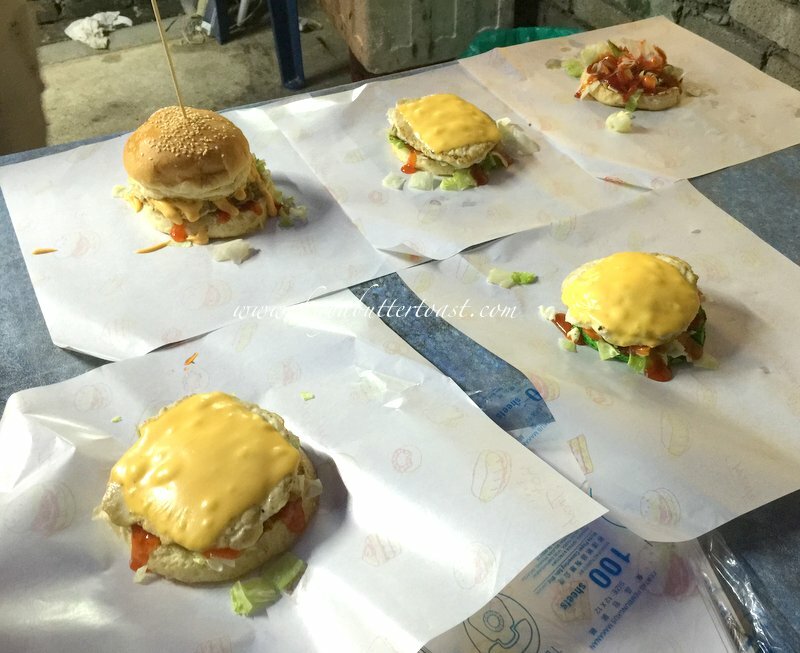 The only difference between each of the burgers is their sauce and also their buns. 🙂 Well, read on. This burger comes with BBQ sauce and if I am not mistaken charcoal buns. This is really matching as level 6 Balloons in COC is black in colour! 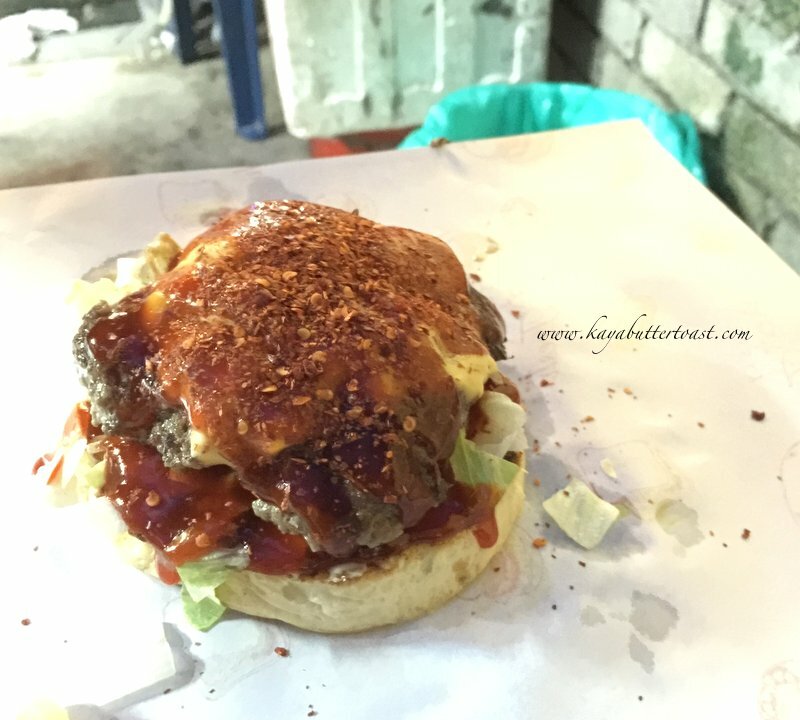 This burger comes with the normal Life’s chilli sauce but the bun is different. It is pink in colour because it has a strawberry flavour. Hence, it really pairs with the name given. Awesome stuff. I think the Pekka name is given because it rhymes with pepper. The sauce used is black pepper sauce. 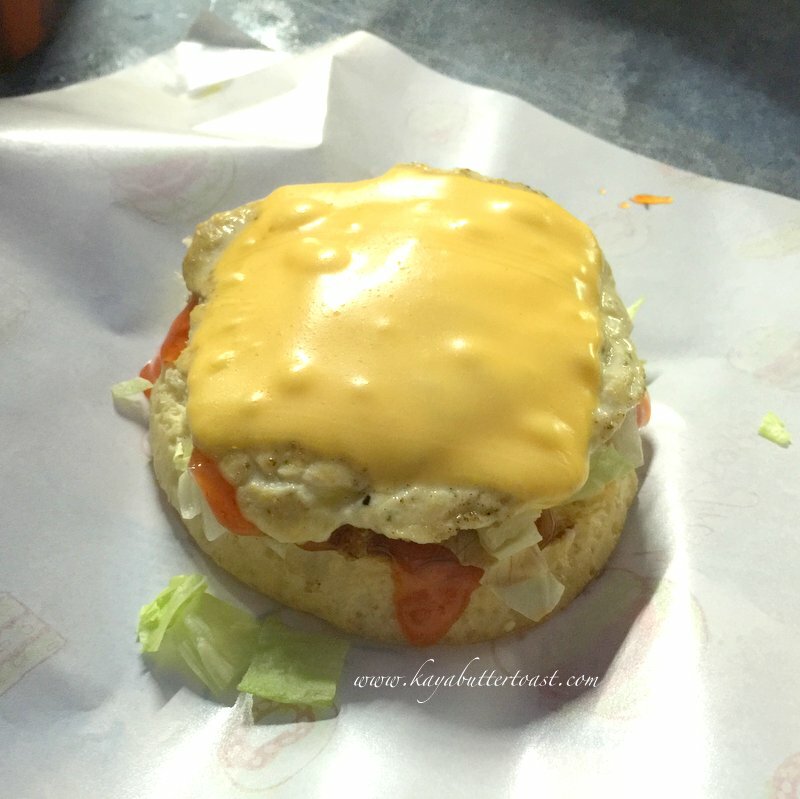 This burger comes with the extra cheesy sauce, just like the ones used in KFC as what the stall operator told me. This is their BESTSELLER for now. Kaya ordered this! It is very matching with the name as the cheese is yellow in colour! Well, the name explains everything and the sauce they use is the normal chilli sauce and the bun they use is green in colour as they use pandan leaves (screwpine leaves) to get the green colour and they smell fragrant. The name is given because Giant level 6 and above is wearing black feather cape and matches with the black charcoal bun! 🙂 Kaya hopes that they will change the photo of the Giant inside their menu to better match the name. 🙂 They use normal chilli sauce. They use tomato sauce instead of chilli sauce. This is one of the stall owners. 🙂 Very friendly guy! 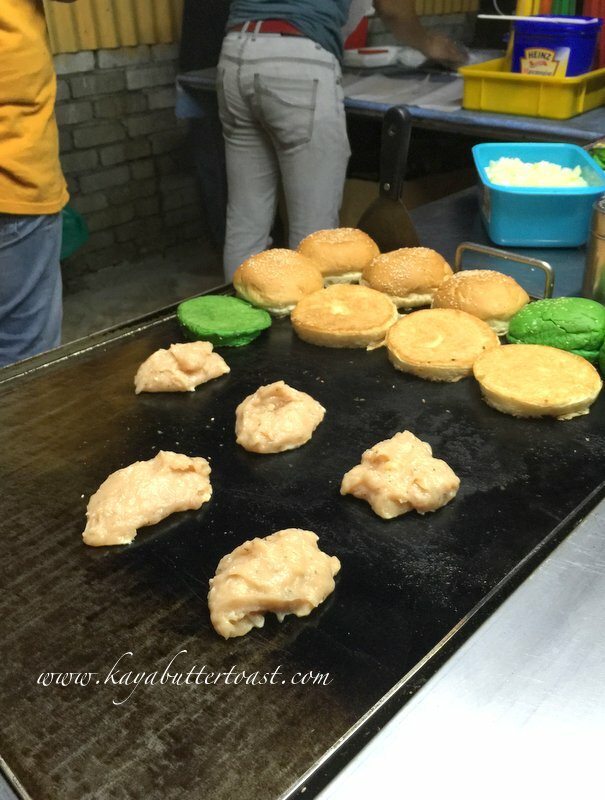 These are the pandan buns which are green in colours. 🙂 You can ask them to change the buns that you like. 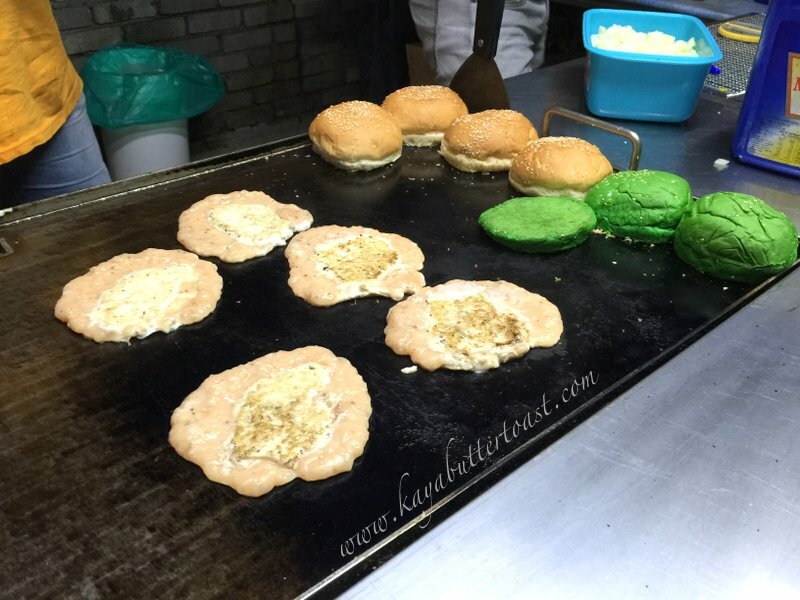 One thing that KayaButter notice is that the patties are homemade and unlike ready-made Ramli patties. 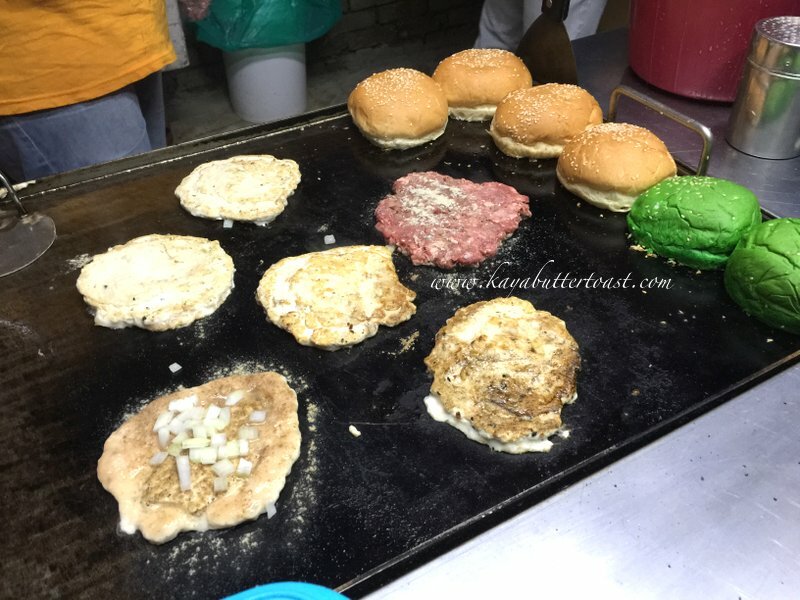 The patties are taken from a packet and shaped as they pan-fried it. 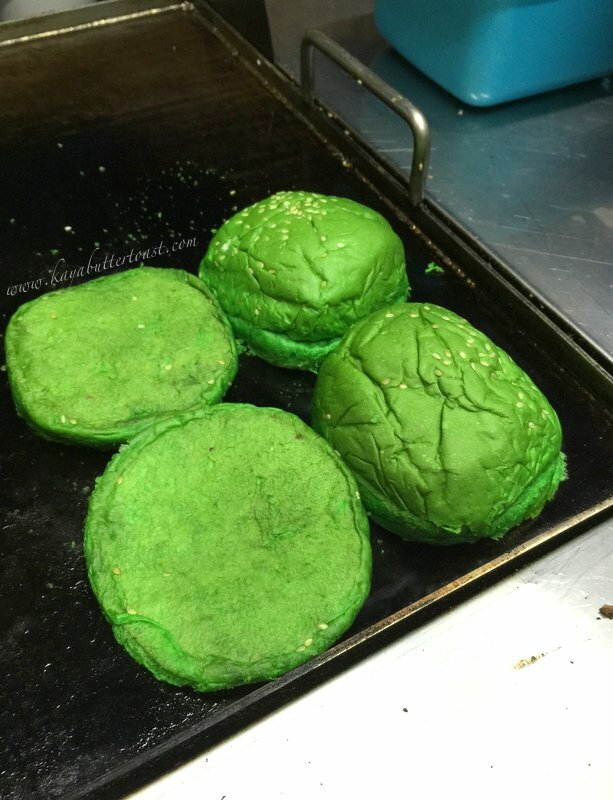 Hence, the inconsistency of the shape of the patties. 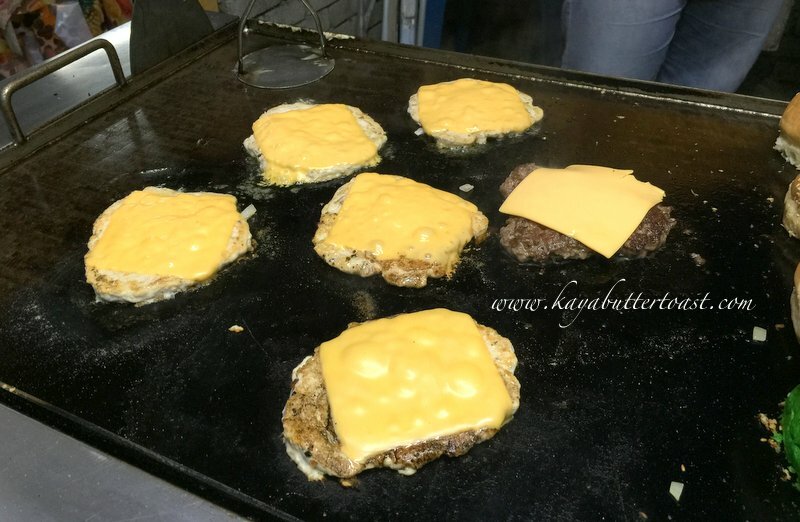 KayaButter believe this kind of patties are fresher than the frozen ones. Kaya only orders Barbarian Cheese. These burgers are for other customers as well. 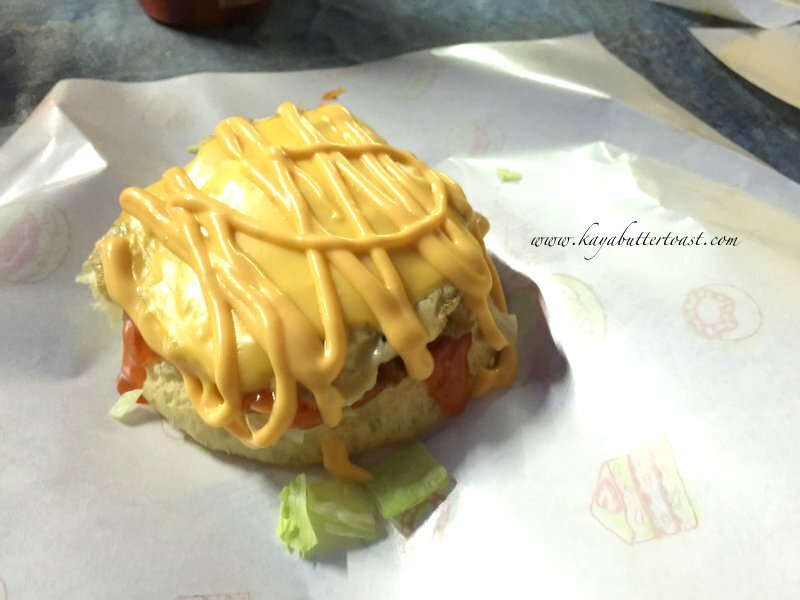 Look at how cheesy this burger is! 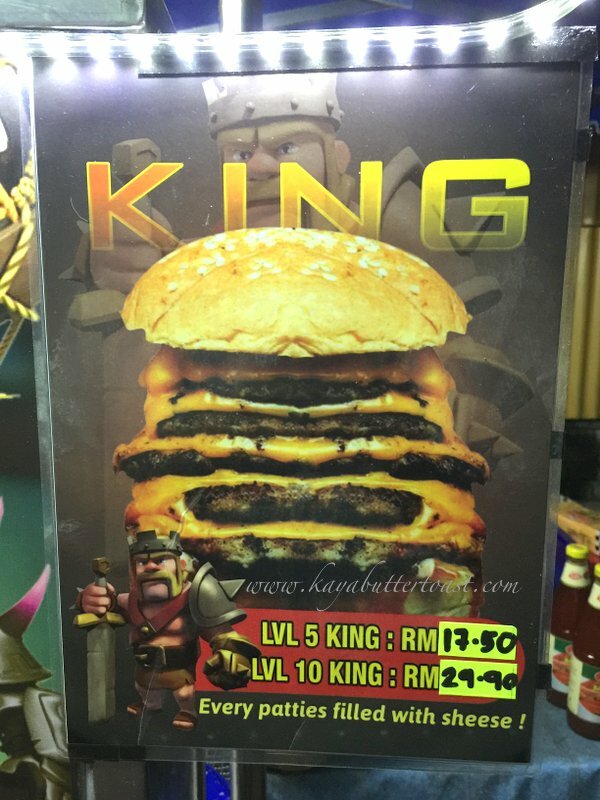 This is how Barbarian Cheese Burger looks like! You can dine in and order drinks. They currently have Coke, Apple & Orange soft drinks. Sorry for late reply. 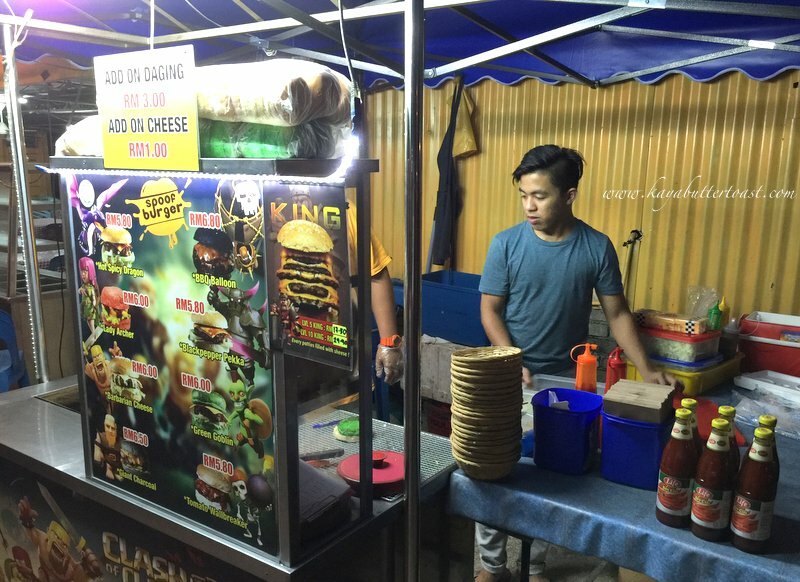 The stall sells both chicken and beef patty. You can request as you like. Hope this helps. Thank you for visiting our blog.